Taste test: Our first tester thought these Australian potato chips had the same sweetness of a fake chicken soup mix (Lipton Cup o' Coup). It was a very light chicken flavor, with a sweet taste — you could taste the honey, not too salty, despite the soy. Our second tester (Keith) thought these definitely tasted like chicken. There was not much soy or honey to taste, but it was slightly sweet. A lot of flavor powder rubbed off onto the fingers, but the chips themselves were crunchy and not greasy at all. 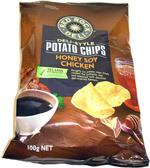 Keith just had a problem with the chicken flavor, as it tasted like someone poured chicken soup mix powder on the chips. Smell test: Taking a big whiff reveals some chicken aroma, with a hint of teriyaki. 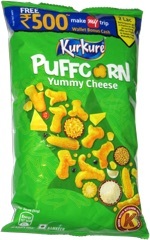 This snack was discovered by Matt W. in Australia. Review published .